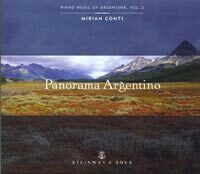 Description: A second volume of Argentinian piano music from this label and pianist (see 07O079 for the first), much of it by composers barely-known outside their own country, contains many examples of Argentinian folk dances, including little-known varieties like the vidala, gato, huella and chacarera along with their more easily recognized companions. Generally, there is an air of sadness and nostalgia, an aching for past happiness or of the expatriate for his homeland. Mirian Conti (piano).